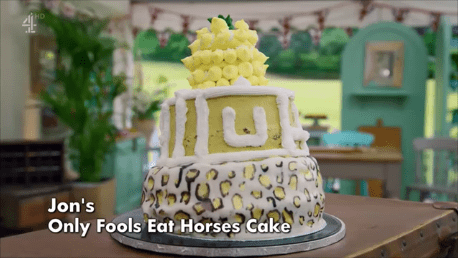 We open with hosts Sandi Toksvig and Noel Fielding watching a happy cow dance in the field like a very tired showgirl because of course we do. It's Vegan Week! First time ever! 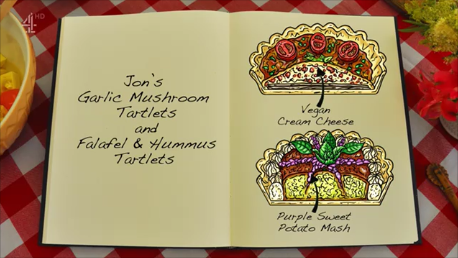 Jon Hendricks is mystified, he had to Google a bunch of vegetables this week, he's out of his monster sausage roll comfort zone! I am similarly unsure, I do have a vegan sibling (and another vegetarian sibling), so in theory, I should be prepared but here we are. Usually I feed them my Butternut Squash Soup or my Black Bean Enchilada Casserole or in a pinch my Eggplant Whatsit With Ricotta recipe I make. If that fails, I take them to Whyte Ave, where Vegans roam free and there are brownies! Our Signature Challenge this week is 8 savoury tartlettes with two different fillings. Easy peasy! 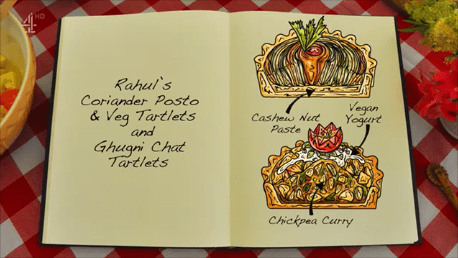 I wouldn't have a clue how to create a savoury tart without meat, but the pastry shouldn't be a problem. Shortening is a poor second to lard but it'll work. Manon Lagreve is using olive oil, making me frown in a concerned fashion. Rahul Mandal's using shortening, there's a lad! Ruby Bhogal is using vegetable oil...and vegan margarine and Imma need a minute. 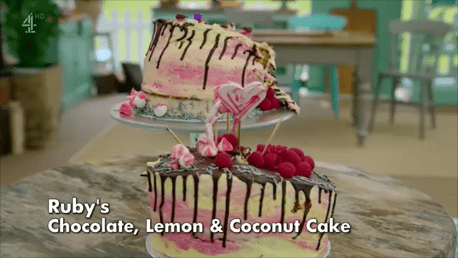 Briony Williams is a big fan of vegan baking. And insists that "vegan is not boring." The baketestants bake their pie crusts blind with loads of beans! Except Jon, who's very behind. You know what's weird? Everyone is using the same little bins of Kitchen Craft white beans. I've been using the same white baking beans for my pie crusts for 20 years, I didn't even know you could buy special ones all the same size and stuff. They dump their eerily symmetrical beans and bake their crusts a bit more while working like madmen/women on their fillings. They all look DELICIOUS! 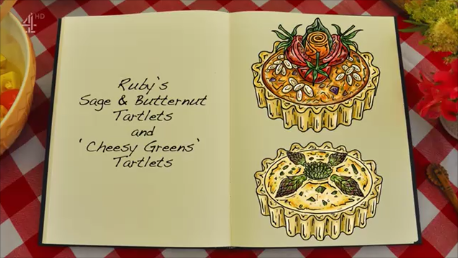 Especially Ruby's tarts, she's got excellent artistic sensibilities. Hahahahaha I had to laugh when Noel asked Kim-Joy if she was enjoying this week, I had also assumed she had this on lock! Okay, she may not be a vegetarian, but look at her shaped pie from last week. I ask you. Jon's struggling now, everyone's trying to remove from their tins without burning their fingers but it's dicey. Decorating takes place in a breathless rush, oh Jon, that hummus being squirted on unevenly in the last 4 seconds doesn't look quite QUITE. Judging! Paul Hollywood and Prue Leith are READY! 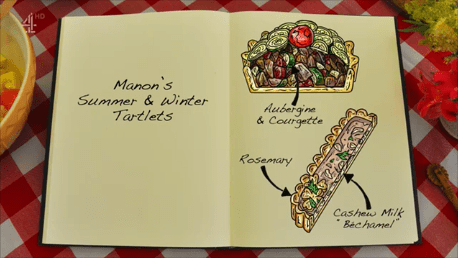 Her winter tart gets rave reviews, the summer gets "decent"
Overfilled, lovely pastry, "POETRY" judge Prue Leith calls it POETRY! "Look a bit of a mess", "gluey, rubbery" "too heavy' okay I'll stop now. Sorry, Jon, you really went for it, though! Neat and artistic, great layers. Delicious! Vegan Hollywood Handshake! ...Vegan Technical! From Prue: trust her, trust themselves and it will work! 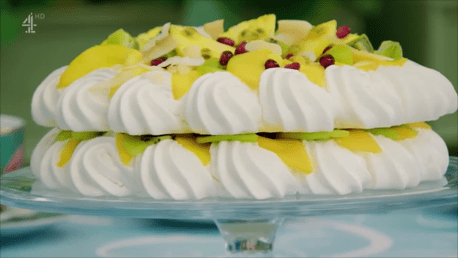 Vegan Tropical Fruit Pavlova withOUT egg whites! Without egg whites??? Why not make macarons?! Honestly. Paul is impressed with Prue's level of difficulty, atta girl! Everyone whips their chick.pea.juice into soft white peaks for the pavlova, but Kim-Joy thinks she's overwhipped hers so will be starting again. We know how the starting again goes, we just lost Dan Beasley-Harding to the Curse of the Start-Over, hurry Kim-Joy! Manon does a weird spiky thing with her piped edges, go classic, Manon! But she does excellent-looking desserts, so I'm not worried. Ruby is astonishingly pretty, isn't she? 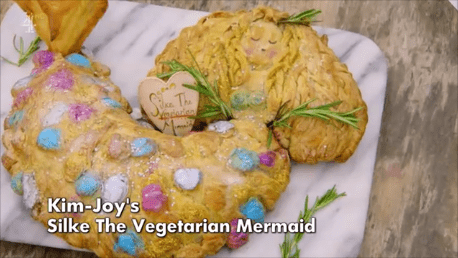 The bottom of Kim-Joy's meringue FALLS OFF. Eep! 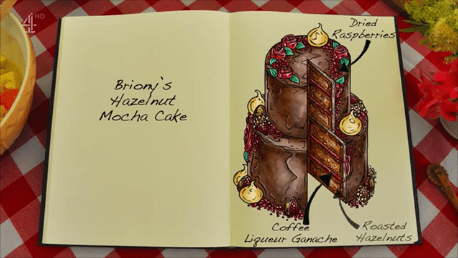 Oh I love the look of Ruby's and Briony's, so pretty! They all look lovely! 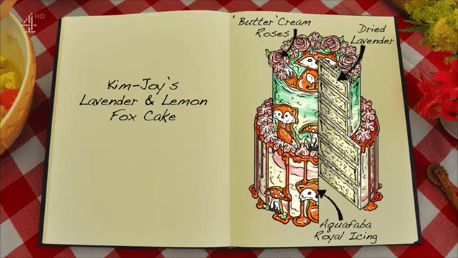 The bakers all do fairly well (save Kim-Joy, good thing you nailed the Signature! ), from worst to best we have: Kim-Joy, Briony, Jon, Ruby, Manon and Rahul wins! 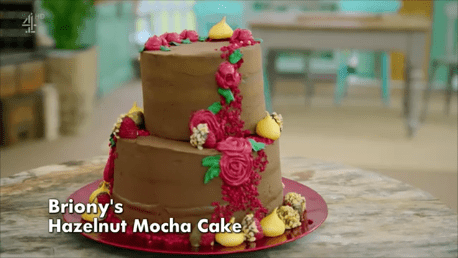 Let's see what everyone's doing for a Vegan Celebration Cake for the Showstopper Challenge! 4 hours, givver baketestants! Wow, I never thought I would roll my eyes at something more than I do at Coconut Oil, turns out I just hadn't met the right vegan margarine. 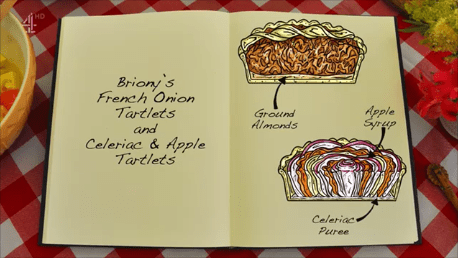 Lots of bakers are using it, even though there's "margarine" right there in the title. *Totally unnecessary aside: in Canada, the Canada Food Guide was recommending margarine over butter, which helped me to understand that the Canada Food Guide was created by people who have never eaten food before. 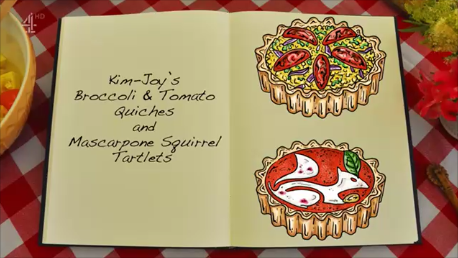 Kim-Joy has a fox theme this week. 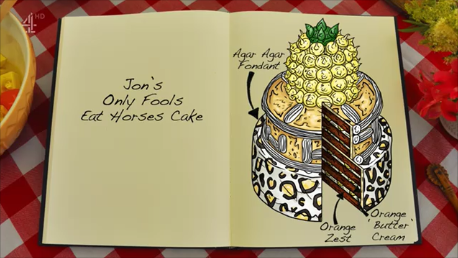 Somebody hold me: Jon is making a whole cake without mentioning his family once. Just about everyone is using bicarbonate of soda and vinegar to make the sponges rise, I have never heard of that. Is that because of the margarine? 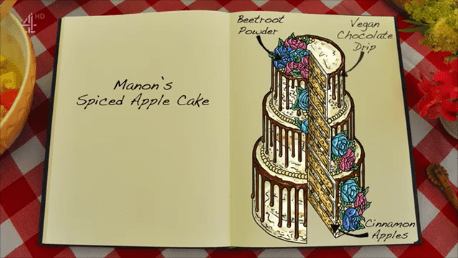 Briony is making a cake for her brother, with roses and "MOCK-ah" which is how I gather the Brits say "MOKE-ah"
Manon is making a cake without chocolate, I'm not sure I understand? Rahul knows what's up, gimme the Grandma Tribute Whatsit! 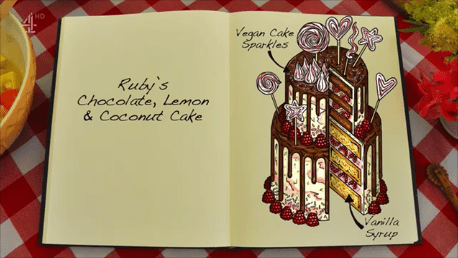 Ruby's making a cake for a family member too, do you suppose Jon just likes to swim upstream? "Every week is for my family, unless everyone else does that then it's about a sitcom where people don't eat horses." The sponges are out of the oven, cracks abound! Moist, but not too stodgy, but also claggy and some of that sounds like stuff that would get in my teeth. Everyone ices their lovely cakes, Briony is a MACHINE. They all make the buttercream roses look so easy. Oh no, there are so many leany cakes, Ruby's in particular is about to fall over, she's got three people on it and she's trying to put the bigger part on top! The bakers leave the tent and Ruby's cake makes a run for it. Absolutely beautiful but very heavy, tastes awful. "Not a good cake at all" I think Paul was personally offended by that cake. 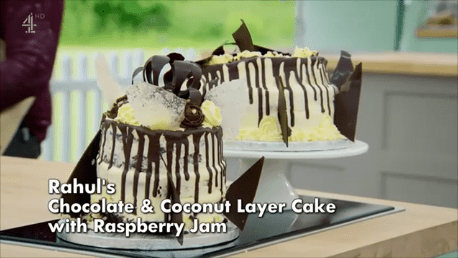 Whoops, his drizzle sank the whole cake. Wow, Prue likes it! Just look like shite, Paul thinks the cakes should have been stacked opposite as I mentioned as well. Jon and Ruby are in trouble, but I don't think we've seen the last of her yet. 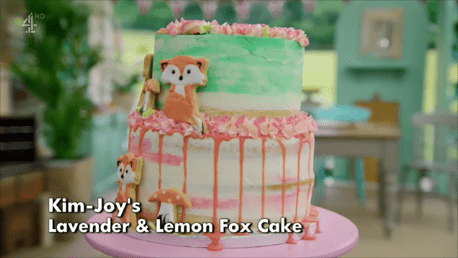 I'm surprised to hear Kim-Joy up for Star Baker, as she was last in Technical, but she did two presentable bakes, so there's that. 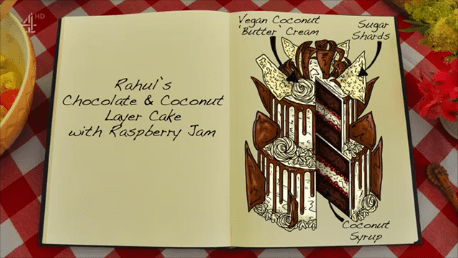 Rahul's even in there, drizzle-sogged cakes be damned. Interesting. And going home: ah Jon, he's going to make me cry. His face is red already before they announce it and I'm so sad he's going! 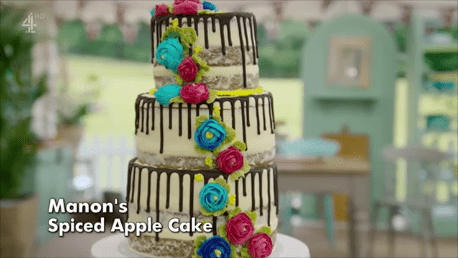 He's one of those guys that's always got a joke ready, but his work The Great British Bake Off was no laughing matter: he is a great baker. I will miss your mango spheres, man, enjoy those kiddos of yours.